Jasol offer a premium range of environmentally friendly cleaning chemicals. EC1 is an environmentally responsible and very convenient all in one cleaner and sanitiser that is highly effective in both hard and soft water. EC1 is made from renewable plant resources rather than oil based ingredients. EC1 is readily biodegradable. EC1 is fragrance-free making it an ideal product for use in food preparation and processing areas. Environmentally responsible and highly effective No Rinse Sanitiser. 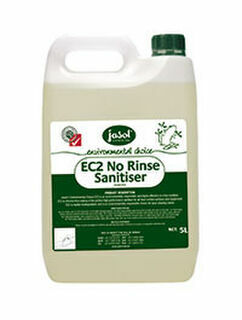 EC2 is chlorine free making it the perfect high performance sanitiser for all food contact surfaces and equipment. EC2 is readily biodegradable. through the toughest of soils in all water conditions, leaving your crockery and cutlery sparking clean. EC13 is made from renewable plant resources rather than oil based ingredients, is readily biodegradable and is an environmentally responsible choice for your cleaning needs.